Sony seems to offer a new flavor as far as cinematography and digital imaging concerned as it introduces two new single body 3D camcorders just recently. And one of these professional camcorders is the PMW-TD300. Basically, this new camcorder promises to bring greater flexibility when it comes to live shoots thus, giving more freedom to its user to focus on image capture. 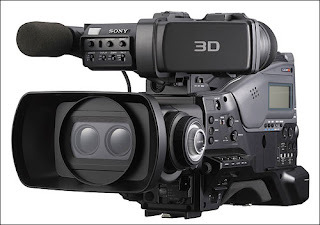 Sony decided to come out with this new camcorder in order to address the needs of those people who are involved in live 3D production by simply working as perfect complement to the HD cameras currently being used by the leading production companies. In addition to this, the PMW-TD300 is also expected to give its users and other creative professionals a more flexible and mobile option thus, resulting in getting their best 3D shot. Additionally, the PMW-TD300 is a professional 3D camcorder that comes with a compact shoulder-mounted design that helps in providing a more comfortable and stable shooting platform, which is very important in creating good quality 3D images. It is very simple to operate and also eliminates the burden of going through complicated user adjustments before shooting. It seems that the Sony PMW-TD300 offers a good line-up of features to boast of. This will surely captivate the interest of a lot of people especially those who really love shooting 3D platforms. However, please take note that its spec and features may also vary from country to country.